Another trip to Spain, another Island to visit! Mallorca is beyond beautiful. We spent a week exploring this Island and it was not long enough. It’s the perfect place to experience Spanish Island culture with both an incredible city (Palma) and nature! Definitely hire a car because there is a lot of driving around and you don’t want to be stuck on a bus! (There are really long, windy and slightly narrow roads around some parts of the island). Below is what I loved the most from our week there and what I would recommend to do. We stayed in a few different hotels just so we could experience most parts of the Island. I’ll also be posting a few short travel videos here from our week in Mallorca so you guys can see more of all the places we visited. Can’t wait to go back! There are gorgeous beaches absolutely everywhere! I heard there are thousands of beaches around the island. For me personally I loved the Northern and Eastern beaches the most. Cala Figuera my number one favourite beach that I went to in Mallorca. I dream of this beach now! It’s literally heaven. In the same area you can also find gorgeous beaches like Cala Murta, Cala de Sant Vincenc and most of the beaches in the region of Pollenca are really good! If you are in this area definitely drive up to Cap Formentor for the stunning views! We went later on during the day when there were less people (it was a bit overcast so that helped with smaller crowds). Cala Ratjada has a few beautiful beaches around it however they do get busy easily. Visit Cala Mesquida and also my second favourite beach from the trip was Cala Torta (there is also a cute beach bar serving seafood). This beach is less busy than others that are closer to Cala Ratjada town. To the left you will see a walking trail and it will take you to a really quiet and stunning beach! Only 5 minutes walk. If you are staying around Portocolom or Portocristo, there are also beautiful beaches surrounding these areas. Cala Varques, was my favourite from this part of the Island. There are lots of beaches on the West side of the Island such as Banyalbufar, Cala Estellencs, Cala de Valldemossa, however for swimming they weren’t as good as the other beaches we visited. There are hiking trails everywhere around the Island. We mainly explored coastal walks. These are a few hikes that are really worth the view and a great challenge if you like to hike! If you are staying around Cala Ratjada then you should definitely do the hike from Cala Agulla to Talaia de Son Jaumell (A Watchtower) around Cap Des Freu and then follow the trail to Cala Mesquida. Check out my video here to see this hike. We were recommended by a local to do it, did not realise how hard it would be! We also got lost, which didn’t help, however…It was an epic day and I would do it again for sure. It’s not a really long distance but it does take 2 hours in total because it is quite steep (Wear closed shoes too). In Pollenca you can hike around Formentor. That is beyond stunning! There are a lot of beaches with trails and they need to be hiked to (Check my list above). The ones that are harder to reach are always the best! On the North West side of the Island you can find Sa Calobra. There are a lot of cliffs and rocky beaches there, as well as a walking trail from the beach. The actual beach I’m not including it as a recommended place to swim just because it isn’t as nice as other beaches, but it’s a great place to spend a morning or afternoon exploring (Just avoid high peak season as it gets really busy). It’s well known for cycling and there are heaps of hiking trails around. Arta town is super gorgeous. It’s one of the nicest Spanish towns I’ve ever been to. So quaint, picturesque and there are markets on Tuesdays which are great to pass through. There are cute restaurants, boutique stores, and the historic castle at the top of town Sant Salvador is a must! You will find stunning views of the town (check out the photo below). Palma, Palma, Palma. I had no idea that Palma was this stunning. It seemed like an oasis mixed with a gothic and Spanish city. So Barcelona, but on an Island. We ended up visiting Palma a few times over our stay in Mallorca, just because we wanted to explore it more and there was so much that it had to offer. I loved getting lost in it’s little streets and finding galleries and boutique stores. The Cathedral La Seu (Cathedral of Santa Maria of Palma) is breathtaking and the old city is a great place to spend a late afternoon exploring. If you are driving around this part of the Island you will drive through a lot of traditional Mallorcan towns that are worth a short stop at. Definitely check out Pollenca too, this region has a lot to do! More information about the region can be found here. 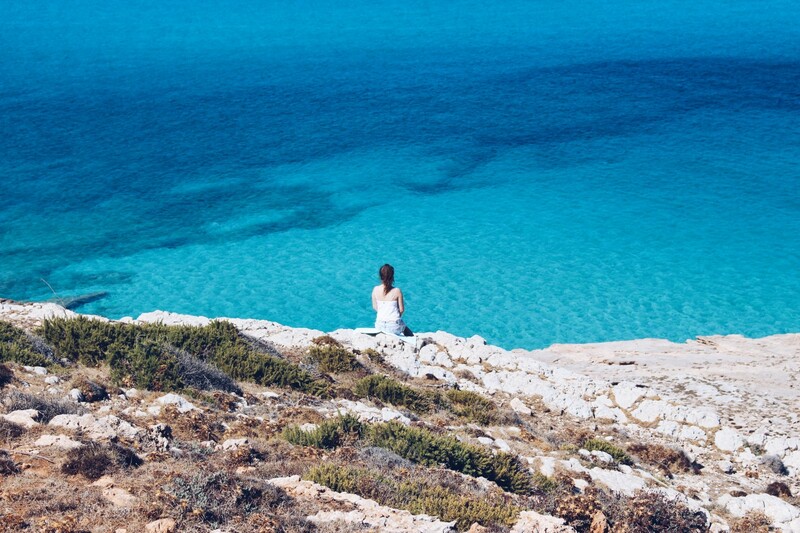 Visit the Salinas that produce the Mallorcan salt that you can find all around the Island. They have tours every couple of hours that are worth a visit! This restaurant is an experience you don’t want to miss. Sa Foradada is a family owned restaurant located on the West side of the Island only accessible by walking for 1 hour or by boat. They make the best tasting paella cooked on a wood fire grill. Serving a few varieties of Paella, this place is a must! Lidia now runs the restaurant along with a good team. The paella we had was a seafood paella and it was so delicious I tried to savour every bite. We walked down to the restaurant passing donkeys, pine trees and stunning views, finally arriving for lunch we sat next to the kitchen whilst the chefs were preparing paella. The beautiful ocean view, the open fire kitchen and the smell of paella cooking created the perfect ambience. Their secret stock is cooked for hours, the wood they use for the fire is from the surrounding pine trees (they have permission to use the wood) and the seafood they use is fresh fresh fresh. The only bad thing about visiting this restaurant is the uphill walk back to the car (There is parking). Right in the centre of town this is an unexpected hidden gem. It was kind of hard to find a decent non touristy restaurant in Cala Ratjada that doesn’t serve commercial food imported from other parts of europe. When we found this place we booked it instantly! Run by a mother, father and son team, this restaurant serves seasonal and local produce, with some of the produce grown and raised from their own family farm and the seafood they use comes from the coast of Mallorca. The tables are surrounded by beautiful herbs and flowers and it’s very peaceful! We were very happy after stumbling upon this restaurant! Seriously delicious Mallorcan and Spanish dishes – absolutely loved the flavours and the menu. So many vegetable, meat and seafood options! We were tempted to come back here the next night. The restaurant also has a great atmosphere, fantastic bar serving great cocktails and an overall great drinks list! Try the sardine and marinated capsicum salad – It was absolutely amazing. Make sure you book however we went there without a booking around 9:30pm at peak dinner hour in Spain and waited at the bar for a bit. Another great place in the city centre of Palma. We loved their calamari in squid ink, their sardine and couscous salad, as well as their beetroot gazpacho shots. The octopus was cooked to perfection too! A great place for a nice quiet dinner. We arrived early though so not sure what it’s like later on there! I’m not kidding when I say that we had ice cream nearly every day. One day, I even had it twice. I wouldn’t normally be so ice cream obsessive…but this place was unbelievably delicious! All of their ice creams are 100% natural and so the flavour is so good. I just got hungry thinking about their bourbon vanilla flavour. They are a franchise so you can find them around different locations.